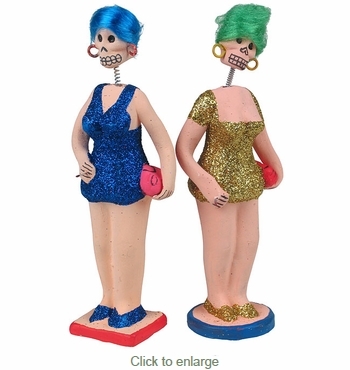 These quirky skeleton ladies of the night will make a humorous addition to your Dia de los Muertos decor. All of our clay skeleton figurines are handcrafted by artisans in Mexico. We will choose your Ladies of the Night skeleton from our assortment of available colors. Price is for one skeleton figure.